Goodbye Grey Hair! Restore Your Hair Color & Look Younger! Is your diet speeding up your aging? 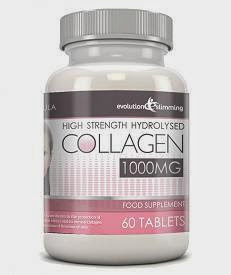 6 Foods that enhance collagen production include tomatoes (rich in lycopene; this helps fight collagenases, enzymes that destroy the collagen in your body), garlic (which contains large amounts of lipoic acid and taurine, "essential for rebuilding damaged collagen fibers"), soy products ("contain genistein – a substance that helps in collagen production and battling skin aging"), dark green vegetables, omega-3s, red fruits and vegetables (rich in antioxidants which combat the free radicals that damage collagen as well as other body components).